Well, I say "dish," but the more accurate word would be "trough." It's called The Hibernator, because of course it is, and they're serving it at Bear Grills Cafe in Congleston, Manchester, England. The daily recommended caloric intake for a sedentary adult male between the ages of 19-30,* by the way, is 2500 calories. The Hibernator also weighs in at seven lbs (as much, the linked article repeatedly notes, as a newborn baby). It costs £19.95 ($32.07), and anyone able to finish this nightmare gets a t-shirt (which probably won't fit them until their inevitable emergency food c-section) and £100 (which will come in handy for paying for said inevitable emergency food c-section). So far, this Everest remains unscaled. But what's actually in this monstrosity? 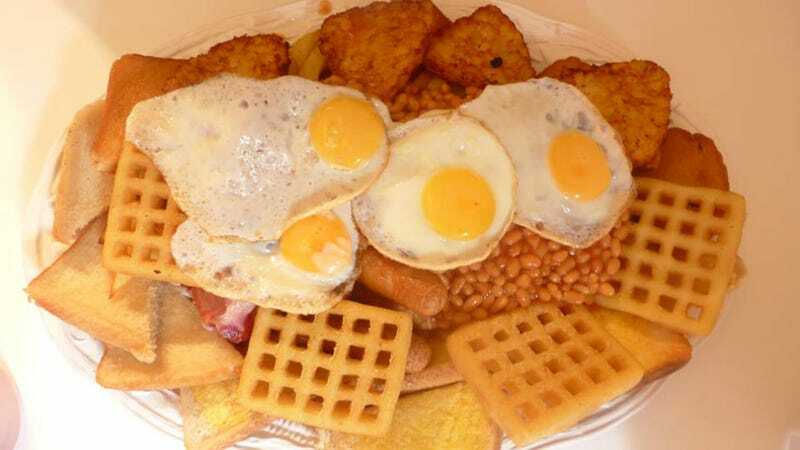 [The Hibernator] consists of eight rashers of bacon, eight sausages, four hash browns, four fried eggs, a four egg cheese omelette, four waffles, four pieces of toast, four pieces of fried bread, four black pudding, two ladles of beans, two ladles of tomatoes, mushrooms, a portion of large chips, and a two pint milkshake to wash it all down. I would've been fine looking at the pictures of this thing if not for the baked beans, which are making me glad I haven't eaten dinner yet. Anyway, I have to admit this is impressive, because unless someone is drinking a gallon of KFC gravy for breakfast (anyone who's ever been to Alabama might regard this as a distinct possibility), it's hard to see what could be more punishing than The Hibernator. "We have a disclaimer which says that no one under the age of 18 can take part and that they know about the very high calorific content and high fat content. We ask people to understand that they know what they are getting themselves into. They have to tick a box to say whether they have any underlying health conditions." The Hibernator is the real-life version of the Skip's Scramble, only without Ron Howard's sage warning that you should not order the Hibernator. * This is the highest recommended caloric intake of any age group (and the most likely to order it), which is why I went with it. It gets way worse if you look at some of the other age brackets.